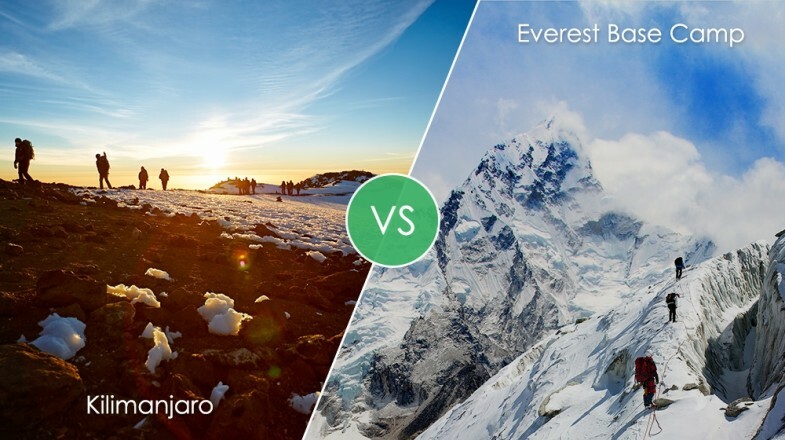 Everest Base Camp vs Kilimanjaro: Which one should you go for? Home › Asia Tours › Nepal Tours › Nepal Travel Guide › Everest Base Camp vs Kilimanjaro: Which one should you go for? The Himalayas are the roof of the world, and nowhere is this more obvious than in Nepal. 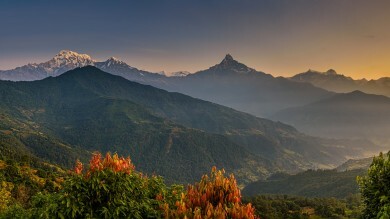 Many of the world’s tallest peaks are located here, so it is definitely a bucket list destination for many a trekker. On the other hand, Tanzania has been attracting millions of adventure lovers from all over the world thanks to wonders like the Kilimanjaro National Park and the Serengeti. We would all love to travel to each and every one of these places. However, we all face restraints. Have you ever found yourself in a dilemma, having to choose between two heavyweights – Everest Base Camp and Kilimanjaro? Let’s take a look at both these places before we decide! Mount Everest needs no introduction. The tallest peak in the world has attracted many an adventurer and daredevil. However, it is incredibly difficult, time-consuming, and expensive to summit Everest. This is where the Everest Base Camp trek comes in. It ensures that you get as close to this iconic peak as possible without having to go through the ordeal that the Hillary's and Norgay's of the world have to. The Base Camp offers a beautiful bargain for those who do not have the time and commitment to summit the tallest mountain in the world, and easily the best view of this iconic peak! This trek to Everest Base Camp will be quite challenging, but every step you take in the trek will fill you with more awe and beauty. In fact, the moment you spot the snow-covered peak of Mount Everest, all these troubles will just melt away. Furthermore, all along the trek you will be surrounded by some of the world’s most beautiful mountain scenery. 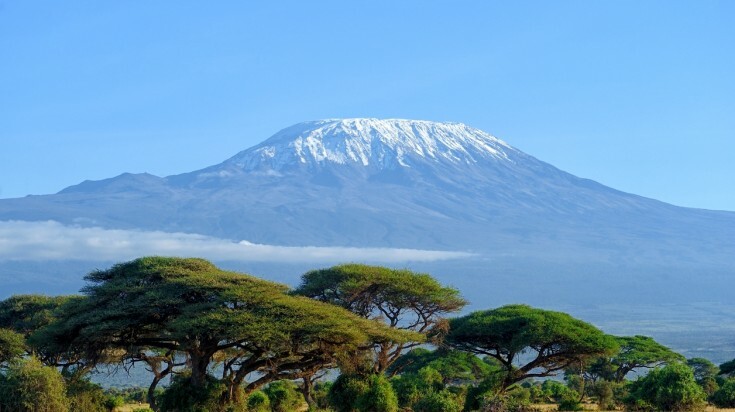 Kilimanjaro is one of the tallest peaks in the world, and the tallest peak in Africa. It’s popularly known as the “roof of Africa”, and for a good reason. This towering behemoth is the tallest free-standing mountain in the world, after all. A trek up Kilimanjaro will bring you close to the heart of Tanzania, and give you a rather spiritual experience. An ideal Kilimanjaro trek will take you through the Shira Plateau, Lava Tower, Crater Camp, Arrow Glacier, etc. Of these, the Lava Tower and Crater Camp are unique. Lava Tower is a 300 ft. tall volcanic plug, while Crater Camp offers unparalleled views of natural ice-sculptures within the glacier. Of course, climbing Kilimanjaro would not be complete, until you reach Uhuru Peak at 5,895 m. This peak will put you on top of the world, quite literally. Stop for a few minutes, and enjoy the serenity, and the vast, endless land that stretches in front of you. It’s a spiritual moment that will help you reconnect with earth, and there is no feeling like it! A trekker getting close to Everest Base Camp with Mt. Everest and its 8,850 meters looming in the background. 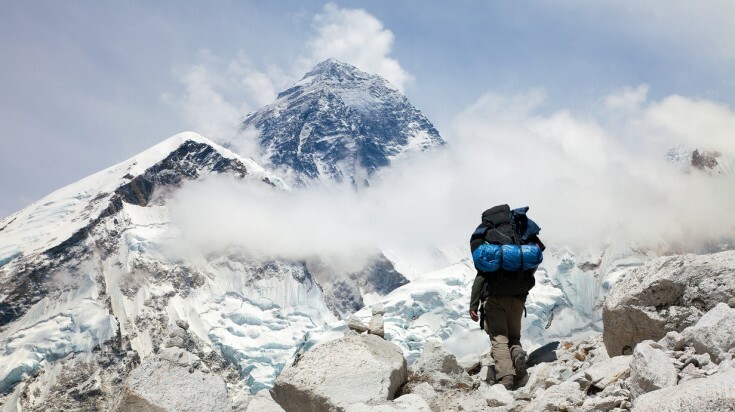 If you are an adventurer, you are probably incredibly excited about Mount Everest. 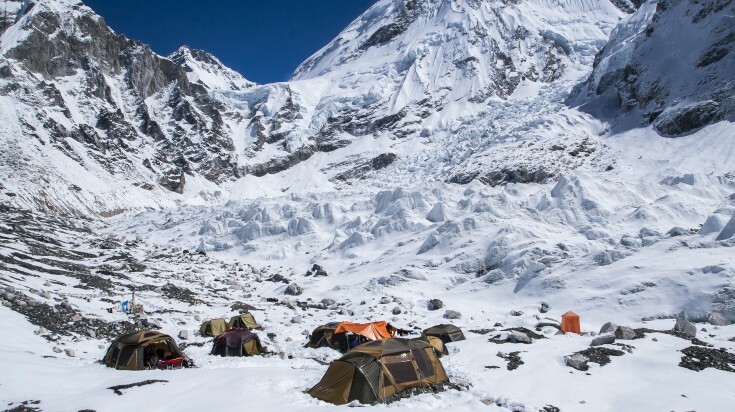 Even the Base Camp trek is a bit challenging, and requires quite some preparation, but it is also the greatest and grandest experience you’ll ever experience. This is, after all, the best of the Himalayas. The weather in Tanzania is ideal for trekking almost the year around (except for the summer months), so you won’t have to plan your trips within a short window of time. Better yet, any trip to Tanzania is also full of wildlife adventures and some of the best animal sightings on the planet! Zanzibar is a stone’s throw away from Kilimanjaro, so you can also enjoy a tropical vacation once you’re done summiting the mountain. 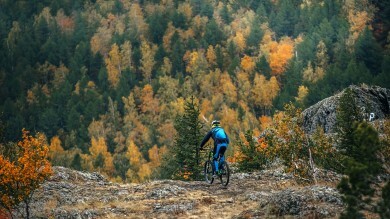 The right trek for you depends on a number of different factors. What kind of climate do you prefer trekking in, what experiences are you looking for, and which part of the world you’d rather travel to? Both these treks are magnificent, and must-go for every avid trekker out there. Here’s a small comparison of both these treks! 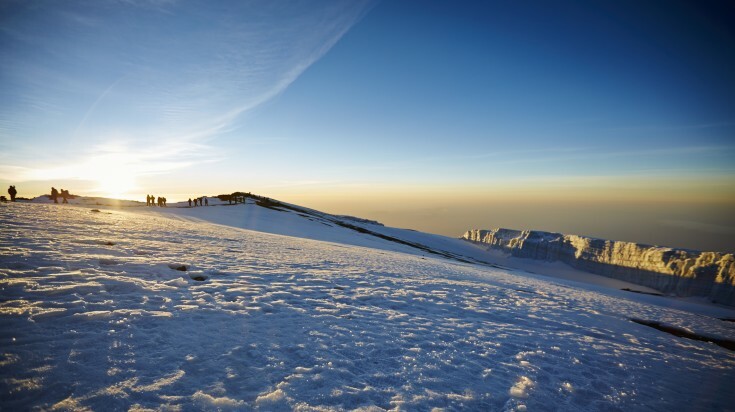 Difficulty: Summit day is more difficult on Kilimanjaro, but EBC requires a greater level of endurance and physical fitness over a period of 12 days. Scenery: The Everest Base Camp trek is spectacular once you cross Namche Bazaar, as all those iconic Himalayan peaks start coming into view. When you’re in a region that boasts of presenting four 8000+ peaks, you know you’re in for a special treat. On the other hand, Kilimanjaro is all about exploring different eco-zones. You start with beautiful rainforests, which give way to a cloud forest, before opening out into a moorland zone. The best moment here is watching the sun rise on the ice fields from the summit. In other words, EBC is all about beautiful experiences in a region, while Kilimanjaro is about enjoying yourself on a single mountain! Acclimatization: Kili rises up to a height of 5895m while Everest Base Camp sits at 5,365 m (surprised?) The biggest advantage of trekking EBC is that your elevation is gradual and you get sufficient time to acclimatize. On the other hand, many Kilimanjaro routes gain elevation more quickly and some don’t even follow the climb high, sleep low rule. This is perhaps why some Kilimanjaro routes have a lower success rate. Activities: One of the biggest differences between the two treks is what you’re planning to do before and after your trek. If you’re in Tanzania, you’re exposed to the best of wildlife and tropical beaches in the form of Serengeti, Ngorongoro and Tanzania. If you’re visiting Nepal, you still have the Chitwan Jungle Safari to choose from, but it’s a much smaller experience. What Nepal is big on is its culture! So if visiting an ancient land sounds more exciting than watching exotic animals, Everest is where you need to be! Trekking Experience: Kilimanjaro presents mountain huts run by the national park service on the Marangu route, but all other routes only offer camping. On the other hand, the tea house experience that Everest offers is so unique, a great way to get an insight of the local culture, explore quaint villages as you climb the valley. This whiff into the area’s culture is perhaps the biggest advantage that the EBC holds over Kili. If you had to pick one, which one would it be? We welcome your input.